Nothing but the greatest affection towards my fellow believers is intended in this post. 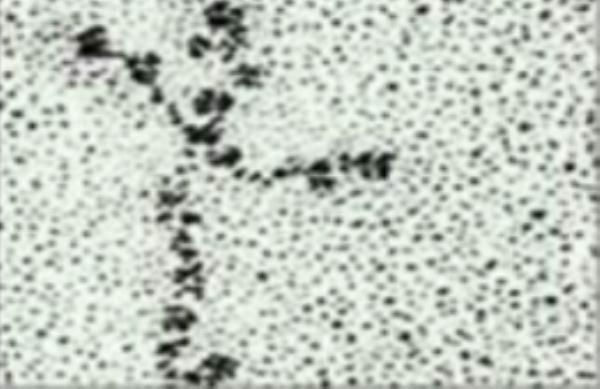 There’s a popular idea in circulation, commonly known from speaker Louie Giglio, that likes to speak of the Cross-resembling shape of the protein laminin, in conjunction with Colossians 1:17 (“He is before all things, and in him all things hold together”), as “proof” that God designed the human body. You should probably know that the world just kinda chuckles when we pass this meme around, and not for no reason. For one thing, that cross looks drunk. But really, while a protein taking one of the most basic shapes possible in nature (and shakily so at that) may strike the already predispositioned as a “wink” from God, it doesn’t really impress unbelievers as proof of God’s authorship. Nor does it need to, for the Gospel to be true. He never said that. That quote has never been adequately sourced to our first president (though correct me if I’m wrong). The enemies of our country’s Christian heritage wouldn’t care if it was, honestly. Almost none of our Founding Fathers, in fact, were Bible-believing Christians according to their recorded words. Nor did they need to be, for the Gospel to be true. Good call. The data from Genesis – words every bit as divinely inspired as the Sermon on the Mount – tell us the Ark existed on the scale of aircraft hangars. Say what you want about the creative liberties taken by the 2014 Russell Crowe movie Noah, but one thing it got right was the general scale of the Ark. It didn’t look remotely like that picture. Nor did it need to, for the Gospel to be true. If you’ll allow me a “get off my lawn” rant before my time, meme culture hasn’t been kind to Christians. We pass around so many half-baked memes as “smoking guns” and seem unaware that they’re historically, scientifically, and Biblically flawed. It’s an embarrassing look. Few of us delve into the real intellectually defensible arguments for Christianity. I get that we’re busy. I get it’s intimidating. But we could at least grab a few quick, sound facts. What cause could be more worthy of our time? Souls hang in the balance. Hostile skeptics are plenty willing to do their reading. I long for a realist Christianity – a faith that strikes the streetfolk as reasonable (if they’re willing to assume the supernatural). That’s why I loved Passion of the Christ, harrowing though it was. The Bible was rough. Flawed, quiet apostles. Tent pegs through temples. A Savior that didn’t look suspiciously like a Seventeen interviewee fresh out of his makeup trailer, but died an ugly death for an ugly people. Perhaps, if it our faith was drawn less like a fairy tale, it wouldn’t be taken like one. Now if you’ll excuse me, I must get back to badly photoshopping eagles and flags onto pictures of Jesus as a white man.